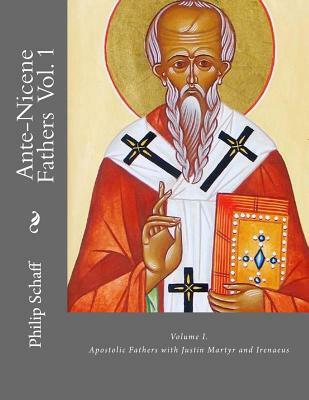 Ante-Nicene Fathers: Volume I. Apostolic Fathers with Justin Martyr and Irenaeus. The Ante-Nicene Fathers, subtitled "The Writings of the Fathers Down to A.D. 325," is a collection of books in 10 volumes (one volume is indexes) containing English translations of the majority of Early Christian writings. The period covers the beginning of Christianity until before the promulgation of the Nicene Creed at the First Council of Nicaea. The translations are very faithful, and provide valuable insights into the spirituality and theology of the early Church fathers.